Solway Lass is one of Australia’s most famous Tall Ships. Built in Martenshoek Holland in 1902 and first registered in Hamburg Germany. Solway Lass was Sydney’s Tall Ship from 1985 until 1999 sailing up and down Sydney Harbour twice a day. In 1999 Solway Lass was purchased by Australian Tall Ship Cruises of Airlie Beach and today Solway Lass is maintained in beautiful condition and provides cruises of the Whitsunday Islands. The large decks on Solway Lass provide our guests with plenty of room to move about and for those who would like a Hands on sailing trip, our guests are invited to join in hoisting the sails and having a turn sailing Solway Lass. Guests who prefer to just find their own deckspace to sunbath, relax and take in the magnificent views of the Whitsunday Islands, as you sail by Whitehaven Beach, Hayman Island, Hook Island, Hill Inlet and Nara Inlet. 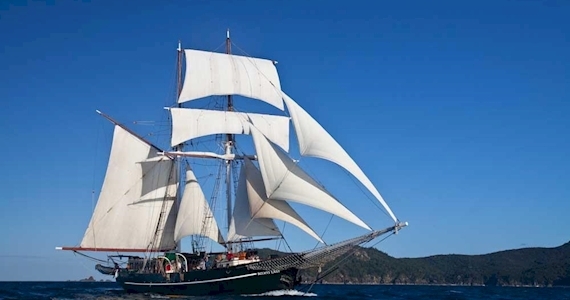 One thing’s for sure, people sailing on other vessels in the Whitsundays will be taking photos of Solway Lass as she sails by with square sails, jibs and mainsails set.